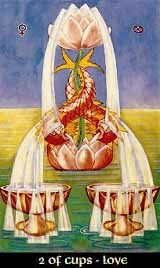 The Two of Cups is the polarisation of the freely floating streams of the Ace of Cups. Where the Ace was all-embracing in its feelings, the Two of Cups has a particular focus. The Ace was unity, the Two of Cups is differentiation, feelings are fucussed on a specific object. Remembering that 2 as a number is the symbol of duality, it implies the Two of Cups needs a counterpart, a source or a goal outside itself.